It's hard to buy a replacement clutch, at least if you want to understand what you're buying. Between the variations in design, the jargon, and the lack of specifications, things can be confusing. Clutch manufacturers don't exactly make it easy, either. Many of the companies selling "performance" clutch kits are tricking consumers. They use bright paint and confusing terminology to make their products look good. They're hoping that consumers won't ask questions. At Phoenix Friction, we want you to understand the clutch you're buying. This is why we created the clutch friction material comparison guide below. Every clutch friction material has pros and cons. If you understand what they are, you can buy a clutch that makes sense for your vehicle. NOTE: If you'd like to view an image of the information below (or borrow the image for your own site), click here. Few auto parts are as mysterious as the modern clutch. From confusing and misleading industry jargon, to common misconceptions about clutch function, there's a lot of bad information out there. 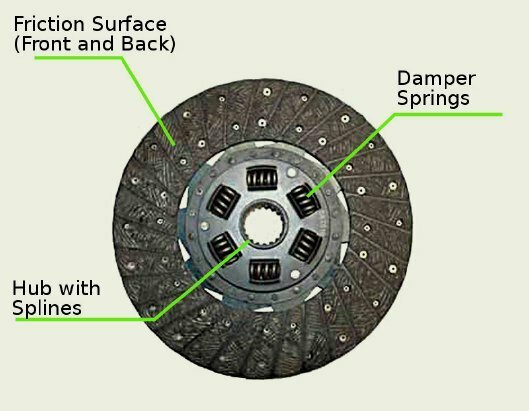 Here's a rundown of the six common clutch friction materials with data and details that will make you a clutch expert! 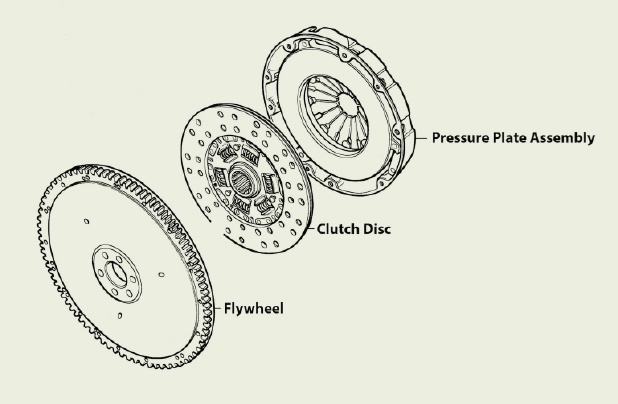 When the clutch is engaged, a spring-loaded clamp called a "pressure plate" pushes the clutch disc onto the flywheel, connecting the engine to the gearbox input shaft and the rest of the driveline. The clutch disc ensures a smooth transition during every engagement, while also standing up to the abuse of this action. Finally, the clutch is usually required to engage and disengage smoothly (racing clutches, not so much). In almost all cases, woven is better than molded. For most vehicles, a woven organic clutch offers the best combination of performance, durability, drivability, and cost. Molded Facings, which are very affordable but lack strength. When tested at 500° F, an 11" OD/6.5" ID molded facing will burst at 5,000 RPM. At Phoenix Friction, we do not use molded facings. Woven Facings, which include fiberglass yarn woven into the material to increase strength. The burst strength of an 11" OD/6.5" ID woven facing is over 10,000 RPM. As you can see, woven organic facings are much stronger than molded facings, which translates to better life and performance. Woven organic friction materials are commonly used in OEM applications, as they offer a good combination of smooth engagement, wear resistance, and strength. Heavy-duty organic clutch facings are similar to normal organic clutches in terms of engagement smoothness, but with more temperature resistance and durability. Heavy-duty organic clutch facings feature more metallic content, which boosts heat resistance and reduces fade. This gives these clutches resistance to temperatures as high as 700°F, at least for short periods, as well as increased burst strength. Heavy-duty organic facings are just fine for most towing, hauling, and street performance applications. They're temperature-resistant, strong, and durable but still smooth. Ceramic clutches are great for racing situations, where repeated engagement and disengagement leads to high temperatures. 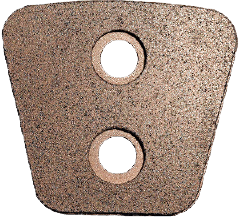 Ceramic clutch facings are made from a mixture of copper, iron, tin bronze, silicon dioxide, and/or graphite. 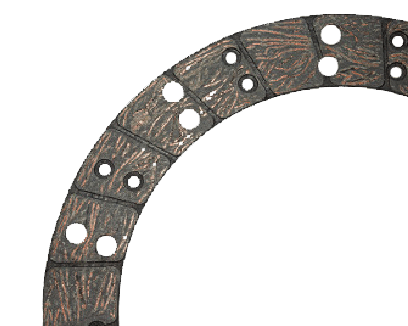 The material is sintered or brazed onto a backing plate, and then often riveted to the main clutch plate. Ceramic clutch facings can withstand considerable heat - they can operate without fading at temperatures up to 1,000°F. This heat resistance makes them ideal for racing. Finally, it's important to note that the ratio of static to dynamic friction is quite high for ceramic clutches. This means that ceramic clutch engagement can be abrupt. Kevlar® and Twaron® are trademarked names for para-aramid fibers that are often used to make clutch discs. Kevlar® and Twaron® have two key benefits: longevity and smooth engagement. In terms of longevity, Kevlar® and Twaron® facings last 2-3 times longer than organic facings, all things being equal. Additionally, these fibers have a low static-to-dynamic friction coefficient, making them an ideal choice for applications where smooth engagement is essential (such as off-road driving, rock crawling, etc.). Kevlar®-type materials offer smooth engagement and last a long time. In terms of torque rating, however, a heavy-duty organic facing is often stronger. Carbotic clutch facings are great for powerful diesel trucks. Otherwise, feramic facings are strictly for racing where quick lock-up is most important (like the drag strip). With a high coefficient of friction and a high static-to-dynamic ratio, most feramic clutch facings are strictly for racing applications where quick lock-up is most important. Feramic facings are made from a combination of steel, silicon dioxide, tin bronze, and graphite. Feramic facings can be full across the face or they can be buttons. 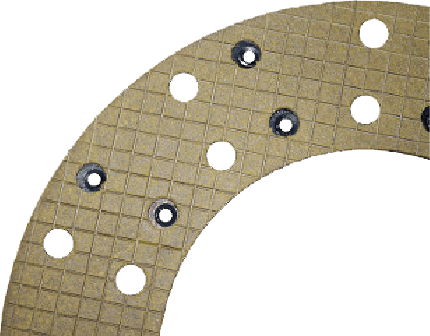 A special type of feramic clutch facing - known as a carbotic facing - is used in truck applications, offering ceramic-like temperature resistance with smoother engagement. A newer material, FeramAlloy facings are likely to replace ceramic facings. FeramAlloy offers similar levels of wear and temperature resistance compared to ceramics, but with a much better static to dynamic ratio (and therefore smoother engagement). FeramAlloy facings also have less "chatter" than ceramic facings. 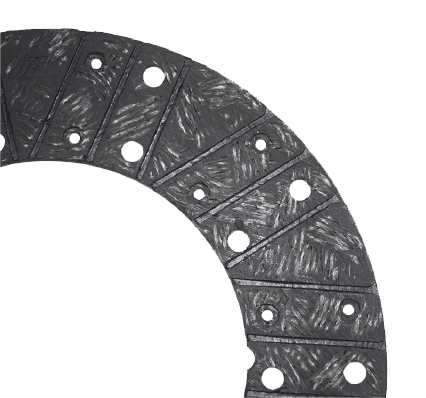 Phoenix Friction is one of the first clutch manufacturers to begin offering FeramAlloy facings for use on heavy-duty applications (diesel trucks, commercial trucking, etc.). For more information, visit PhoenixFriction.com. In order to understand the differences between clutches in terms of engagement and durability, we've assembled some friction coefficient (expressed as "µ") and fade temp data below. Basically, the higher the temp, the more severe the application. Infographic created by Spork Marketing on behalf of PhoenixFriction.com. A good faith attempt was made to gather and collate survey data, as well as to represent it accurately here. However, Spork Marketing disclaims all liability for inaccuracies, as this graphic is created for entertainment purposes only. This infographic is licensed under a Creative Commons Attribution-NoDerivs 3.0 Unported License. If you take nothing else from our guide, we hope that you've learned how to spot a fake performance clutch. A real upgraded clutch kit is not an OE-spec replacement slathered in bright paint. What clutch material am I buying? Why did you select that material for this application? If the manufacturer can't answer these questions - or if the explanations don't make sense - don't buy. There are plenty of clutch manufacturers that make good products.